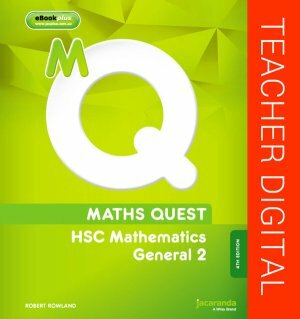 Maths Quest HSC Mathematics General 2 is written for the new General Mathematics Stage 6 curriculum. This text provides comprehensive coverage of the five syllabus areas: Financial mathematics, Data and Statistics, Measurement, Probability and Algebraic modelling. This title features eGuidePLUS: an electronic version of the textbook and a complementary set of targeted digital resources. These flexible and engaging ICT activities are available to you online at the JacarandaPLUS website (www.jacplus.com.au). • A work program that matches the text to the Syllabus and indicates when it is best to link to digital products. • ProjectsPLUS - unique ICT-based, collaborative projects that provide opportunities for students to demonstrate creativity, thinking skills and teamwork and which relate closely to the themes of the Focus Studies.